For the first time ever, scientists have seen a double-star system in another galaxy emitting gamma-rays, the most energetic form of light. 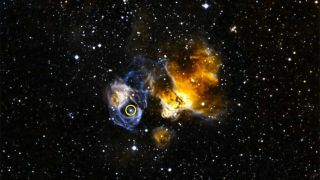 The discovery was made by NASA's Fermi Gamma-ray Space Telescope. Among all of these so-called gamma-ray binaries ever found, the new binary is the most luminous ever spotted, NASA officials said. The binary-star system is called LMC P3, and it's found in a satellite galaxy of the Milky Way called the Large Magellanic Cloud, some 163,000 light-years away. The system is located in the remnants of a supernova explosion, which is the last stage of a massive star's life. Left behind today is a neutron star — the superdense core of the dead star — as well as a massive, active star. The active star is likely 25 to 40 times the sun's mass, and six times hotter than the sun, the researchers said. The neutron star is perhaps twice as massive as the sun, they said. Gamma-ray systems are rare and usually include either a black hole or a neutron star. What makes LMC P3 even more astounding is that it is the brightest known binary system in not only gamma-rays but also X-rays, radio waves and visible light. The X-ray source was spotted in 2012 using NASA's Chandra X-ray Observatory, which located a young star much more massive than the sun. Beside it was some sort of compact object, which, at the time, scientists guessed could be either a black hole or a neutron star. Then, in 2015, Corbet's team hunted for more gamma-ray binaries through data already collected by the Fermi telescope. They discovered one source that changes every 10.3 days, located very near where Chandra's find was. The team also looked at LMC P3 in X-ray light with NASA's Swift satellite, in radio wavelengths with the Australia Telescope Compact Array, and in visible light with two telescopes: the 13.5-foot (4.1 meters) Southern Astrophysical Research Telescope in Chile and the 6.2-foot (1.9 m) telescope at the South African Astronomical Observatory near Cape Town. The combined observations showed that LMC P3's brightest X-ray emissions are at a maximum when the gamma-rays are at a minimum, and vice versa. X-rays and radio waves are likely generated when the neutron star creates a "wind" of electrons accelerated to the speed of light, the researchers said. "It is certainly a surprise to detect a gamma-ray binary in another galaxy before we find more of them in our own [galaxy]," Guillaume Dubus, a team member at the Institute of Planetology and Astrophysics of Grenoble in France, said in the same statement. "One possibility is that the gamma-ray binaries Fermi has found are rare cases where a supernova formed a neutron star with exceptionally rapid spin, which would enhance how it produces accelerated particles and gamma-rays," Dubus added. A paper based on the research will appear in the Oct. 1 issue of The Astrophysical Journal.